Although I work in vegetation, sometimes I get to hang out with the wildlife people. 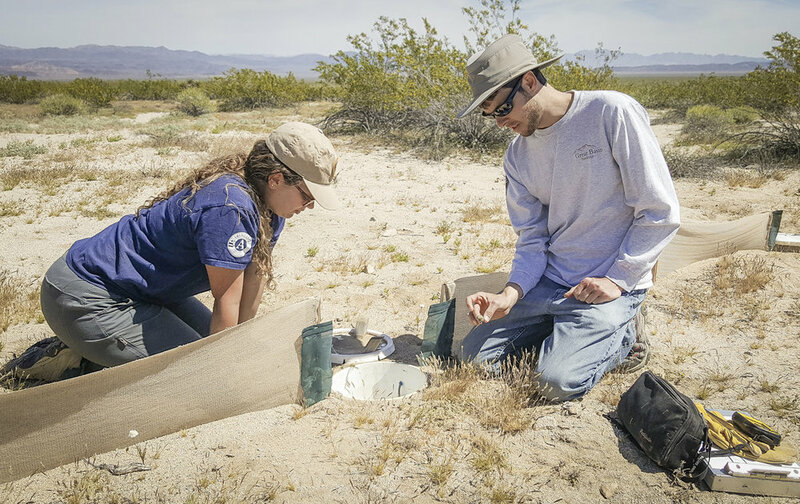 This pitfall trap, one of several dozen scattered across the park, helps us to understand mammal and reptile populations in the Mojave and Sonoran deserts. At night, critters run along the mesh fabric and stumble into the traps. The next morning, anything caught is ID'd, its stats recorded, and then released. With an average annual rainfall of just about 5 inches/year, it's incredible to think that Joshua Tree NP is home to 800+ plant species and that, in about a month, we're expecting to see another incredible wildflower bloom. But more than our flora, the fact that we have two resident amphibian species in this desert park is hard to believe. After working here for a year, I finally spotted our elusive California tree frog (Pseudacris cadaverina) near one of the park's few natural springs. Smaller pools dry up every year at the 49 Palms Oasis, and the frogs are relegated to a tiny patch of water that, we hope, doesn't ever go dry. This is a very small, isolated population of frogs, the only place they've been found in the desert. We don't know how they got here - maybe they're a relictual population from the past. Historically, they've been spotted in other oases in the park, but those have since dried up. In any case, pretty neat. A lot of my work takes me to the most remote places of Joshua Tree NP, only accessible with a high-clearance 4WD vehicle, and then by hiking miles out. At these seldom visited places, I'll often come across abandoned mine shafts. This one drops about 100 ft. below. There are about 120 open mine shafts in the park, often accompanied by historic trash, structures, and old vehicles. An old open mine shaft in the Old Dale Mining District area. Vehicle in the Music Valley area just outside of a remote area of Joshua Tree National Park. Historic structure just outside the Joshua Tree National Park boundary. The California desert fan palm (Washingtonia filifera) exists only in small palm oases in the southwest US and Baja California. Tens of thousands of years ago, these palms were likely abundant and widespread across the southwest during a much wetter period. Today, the tree survives only in small isolated patches in the desert where tectonic activity has permitted there to be standing water. Oases like this one, tucked away in the canyons of the southwest, give us clues to what the Mojave and Sonoran Deserts might have looked like in the past. The fan palm flowers attracting honey bees. A desert fan palm beginning to produce flowers. Sarah Gadomski stencils "DPR" (Department of Parks and Recreation) on tables in a building in Russian Gulch State Park near Mendocino, CA. California State Parks recently acquired multiple tables and chairs and assigned us to "brand" them using black paint. Unopened boxes of tables and chairs purchased by Cal State Parks. Alyssa Pun stencils "DPR" on a number of chairs. In another assignment from Cal State Parks, NCCC Corps Members repaired old fencing in Van Damme State Park, just south of Mendocino, CA. The fencing was installed around campsites in the state parks and by the park's entrance in the 1940s and 1950s. The wood used was from old growth redwoods that were cut down earlier in the century. The fences had deteriorated over time and to repair them, we used other old growth redwoods posts that had been sitting around since the mid 1900s. The wood is naturally resilient to weathering, making it a choice wood for fencing. NCCC Corps Members continue to repair redwood fencing in Van Damme State Park. During our first week working with California State Parks, we were charged with removing ice plant from the coastal areas of Glass Beach. A native from South Africa, ice plant was brought to the California coast around 1900 to stabilize soil along railroad tracks and for general erosion control. An aggressive invasive, ice plant competes with endangered northern California flora. Here, NCCC Corps Members pull the plant and toss it on a tarp to be removed. Alyssa Pun removes ice plant from the Glass Beach coast near Fort Bragg, CA. Michael Green stands by the rugged Russian Gulch State Park coast at dusk near Mendocino, CA. May Duong lies down alongside the team's packed bags, waiting until our departure from the historic Maud Williamson House just north of Salem, OR. This is our second-to-last day of our NCCC Round 1 working with the Oregon Parks and Recreation Department. More Corps Members sit and wait on our last day at our spike housing location. The Maud Williamson house, our project housing for 1.5 months near Salem. Having been USDA Forest Service Class A Sawyer certified, we were able to remove an old, overgrown Christmas tree farm in Silver Falls State Park, Oregon. The Oregon Parks and Recreation Department supplied us with chainsaws and maintenance tools for the job. Oregon is the United State's no. 1 Christmas tree producing state, and in the case of Silver Falls, some of its recently acquired land includes former tree farms. Sarah Gadomski, Michael Green and Amber Anderson removes fallen Christmas Trees from the area into larger piles to later be removed. Taylor Burback cuts down a Christmas Tree. We were able to take some back to our temporary residence of the Maud Williamson House. While at Silver Falls State Park, we took some time to explore the falls that the park is famous for, including the South Falls here, a 93-foot cascade. All waterfalls in the park spill over 15-million-year-old Columbia River basalt. The team worked at the Marion-Polk Food Share in Salem, Oregon for an independent service project one Friday. Alyssa Pun and Michael Green tie bags of frozen chopped broccoli to be distributed to the community. NCCC Team Blue 4 wields weed wrenches used to remove the invasive Scotch Broom at Milo McIver State Park. The difficulty with removing invasive species is that you never seem to remove everything. It's because of this notion that the work, while physical in nature, is more mentally taxing than anything. Exotic species removal may set the invasion back a few years, but it's really just a small dent in the amount of work that really needs to be done. Why spend long 10-hour days removing a plant when, at the end of the week, there are endless fields of it still in sight? You are told that every bit helps, that persistence in the manual removal of the plant adds up in the long-run. But that's only if crews are continuously sent in to remove it. That, unfortunately, does not happen. Grants to organizations that support crews like ours are sparse and quickly run out of money. It could be years before the next crew is sent in, as evidenced by the 10+ year-old Scotch Broom we were removing. Scotch Broom wasn't eradicated during our time at Milo McIver State Park, and who knows if it ever will be? NCCC Corps Members exit the government van to begin work at Milo McIver State Park. The team enters the morning fog. Corps Member Carolyn Stevens uses a weed wrench to remove a several-year-old Scotch Broom plant. Removing the roots is key to prevent the plant's regrowth. Scotch Broom is piled up to later be removed. Scotch Broom (Cytisus scoparious) is a perennial shrub native to western and central Europe and is a noxious species in the Willamette Valley of Oregon. Reminiscent of the dreaded hitches of the Nevada Conservation Corps where we pulled the invasive Brassica, or Sahara mustard, most of the time our NCCC team spent working with the Oregon Parks and Recreation Department was spent removing Scotch Broom. Our first taste of this invasive was at a Willamette River tributary, the Luckiamute River. Scotch Broom was removed from the landscape and placed into a trailer to later be burned. The NCCC team takes lunch by the Luckiamute River. Sydney Lawson handles a snake found on the rocks by the river. NCCC Corps Member Sarah Gadomski installs a native plant at a Luckiamute paddler's access point. The Luckiamute River is a tributary to the Willamette River located within the western Willamette Valley. Under heavy fog, the team planted natives in designated locations governed by the park ranger of the state natural area. Taylor Burback and Michael Green install plants alongside a road at the Luckiamute State Natural Area. 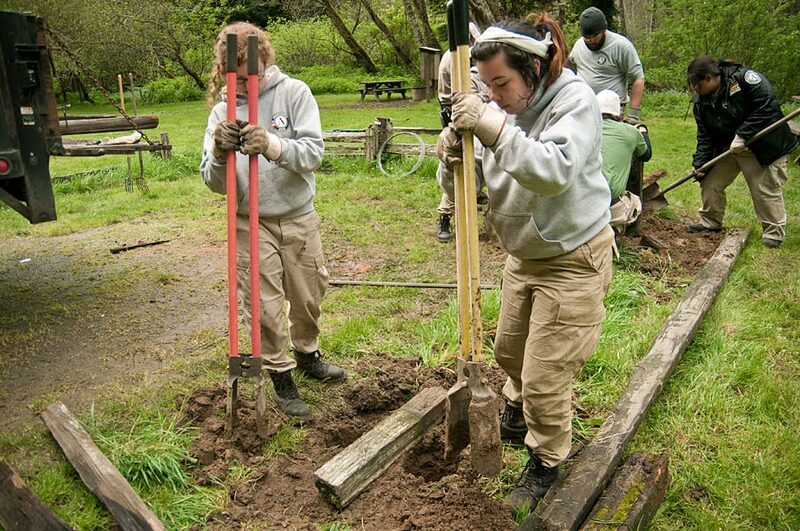 AmeriCorps NCCC Team Blue 4 at Willamette Mission State Park. The team at Willamette Mission State Park. Dog wood and willow stakes are harvested at Willamette Mission State Park to install in a restoration area. These cuttings will take root and eventually propagate throughout the former farmland. Sarah Gadomski walks in Maud Williamson State Park north of Salem, Oregon. Alyssa Pun walks through leaves outside of the Salem Public Library. Visitors ride the Maid of the Mist tour boat at Niagara Falls wearing their provided blue plastic rain coats. A Maid of the Mist tour boat heads towards the falls. Onlookers gaze into the evening mist produced by the falls. A view into the valley from camp. Having forgotten ice for our cooler during the last hitch, we find some snow at the end of a work day and bring what we can carry back to camp. Our summer NCC crew, minus Young and Luke who took their remaining discretionary days before the NCC term ended. We're standing by completed tread (not pictured) in the Mount Rose Wilderness Area. To lessen our weight burden when hiking miles to our camp location, the NCC managed to get us some pack horses to carry our food and kitchen supplies up the mountain. Unlike our food, we had to walk up the mountain. The NCC crew meets the pack horses before parting ways up the mountain to our campsite. After retrieving tools from our tool cache made during the previous hitch, crewmembers continue hiking up the mountain. Dan, Dylan and Luke look into the valley towards Reno. NCC members hike to location where they will continue the construction of a trail that connects the Thomas Creek trailhead to the Tahoe Rim Trail. Dylan Stiegemeier adds wood to a fire at camp. NCC crews have been working on the Rim to Reno project for months. Because of the now extensive distance between the closest vehicle-accessible location and where we are now working, we are camping back country. Normally, when car camping, we would bring jugs filled with water in our trucks, but as a result of our remote location and the displeasure we experience at the idea of hiking 50-pound water jugs up a mountain four miles, we are instead filtering water from nearby streams. Here, Lucas French maintains the water filters to ensure we're getting a steady availability of water. NCC crewmembers take a break to eat. An NCC crewmember slides down a snow-covered area by camp in July. Snow on Mount Rose usually hits a peak at the beginning of April and then starts to melt off. That wasn't the case this year, which has been referred to as the snowiest winter in the last 25 years. I'm a Restoration Technician at Joshua Tree National Park with the Great Basin Institute. I'm from Syracuse, NY where I went to school for Conservation Biology and Recreation Resource and Protected Area Management at the SUNY College of Environmental Science and Forestry (ESF). Life is pretty cool. I try to document the life I observe with iNaturalist, a citizen science tool that allows users share and map observations of biodiversity across the globe. Using crowd-sourced data available on iNaturalist, I've learned a lot about the phenological trends and distribution of flora in Joshua Tree NP, assisting with several of our monitoring projects. Come join!